The standard Biobrick assembly technique provides an easy method to assemble two different biobricks. However, due to the transformation step this technique is very slow and inefficient when fusing several different biobricks together. The new multiple Biobrick assembly technique is a fast and efficient method if several biobricks have to be fused. It doesn't require a transformation step between different assemblies! It uses the primers of the standard biobrick verification (verification forward (VF) and verification reverse (VR)) and the same enzymes as the classic three-way ligation, which are provided by the assembly kit. However it is recommended for fusion biobricks which should be expressed by the same promoter not to use the standard enzymes EcoRI and SpeI as these enzymes create stop codons between the biobricks. For fusion biobricks the enzymes NgoMIV and AgeI should be used as described in BBF RFC 25 protocol. This technique consists of two PCR's, one digestion, one ligation and one separation on a low melting point gel. The technique functions as it is explained in figure 1. Step one is a normal PCR with the primers VF and VR. PCR program and conditions should be selected according to the fragments which are to be amplified. Step two is a digestion either with AgeI or NgoMIV. It is very important to heat inactivate the restriction enzymes before going to step three. Step three is a short ligation under standard parameters for 30 min. In this step many side products can occur. A deeper analysis of this step is provided in the troubleshooting part. Step four is again a PCR reaction under normal conditions with the primers VF and VR. 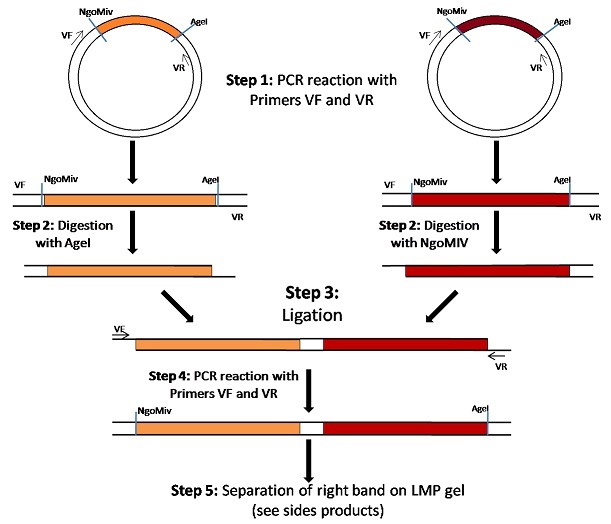 As the ligation step produces side products, several PCR band can occur on a verification gel. This makes step five necessary. Step five is a separation on a low melting point (LMP) gel (1 % of low melting point agaraose). The band with the desired size can be cut out and extracted via a Quaigen gel extraction kit. After step five a purified amplified fused biobrick product is obtained. It can be immediately used to be fused to a third biobrick without cloning into a plasmid and the transformation into a host organism like E.coli.. After repeating this protocol to fuse the three, four or even more biobricks together a final product can be cloned into any plasmid. using primer VF and VR. The following step is the digestion with either AgeI or NgoMIV. Third step is a ligation for 30 min. through a LMP gel and extracted via the Quaigen gel extraction kit. 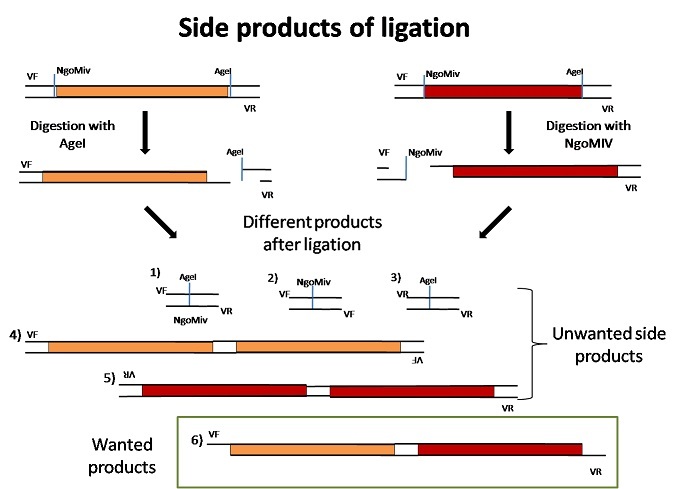 The ligation step creates several different products. This occurs because the NgoMIV and AgeI enzymes are restriction enzymes which cut the sequence as palindromes. This allows same fragments to be ligated together (number 4 and 5) which occurs especially with the short fragments (Number 1 and 3). Also the ligation of the short fragments cut with AgeI and NgoMIV can be ligated (number 2). All possible side products are shown in figure 2.
the PCR amplification. They are digested either with AgeI or NgoMIV and ligated for 30 min under standard conditions. via PCR and product 6) has to be selected through the separation on a LMP gel. All products can be amplified via PCR. So after the PCR reaction there are several amplified products. The right band has to be separated on a LMP gel. This selection on the LMP gel can be difficult when the product consists of two times the same biobrick or two different biobricks of the same size. On the LPM the bands of incorrect ligated products (like number 4 and 5) and the correct ligated product are of the same size. So a separation on the LMP gel is not possible. If two biobricks of the same size should be fused, a nested PCR reaction in step four can be conducted (see improvements below). If the biobricks differs in size they can be selected on the LMP gel. To avoid the amplification of side products after the ligation and to skip the separation step on the LMP gel, a nested PCR can be used. For this reaction others primers have to be designed and the primers VF and VR cannot be used. This different step can be used if two biobricks of the same size have to be fused together. the step four and five in the above mentioned protocol.